These Amazon.com, Inc. (AMZN) signals traded as directed would have performed around 3.6 times better than buy-hold with an ROI of 391% for the period 02-Nov-16 to 07-Dec-18. This is a symmetrical algorithm with no buy or sell bias. "The trading signals for Amazon.com, Inc. (AMZN) were selected for their reward/risk, longevity and parameter sensitivity characteristics. Backtests don't always generate reliable signals which can be counted on moving forward but many traders find value in knowing what buy and sell signals would have worked well in the past. 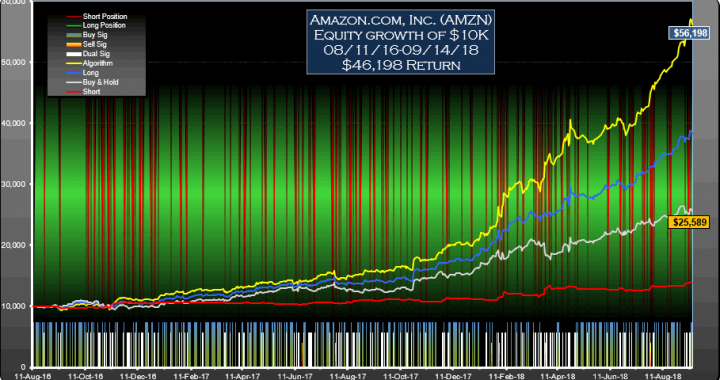 For the 528 day (2.1 year) period from Nov 2 2016 to Dec 7 2018, these signals for Amazon.com, Inc. (AMZN) traded both long and short would have yielded $39,084 in profits from a $10,000 initial investment, an annualized return of 113.5%. 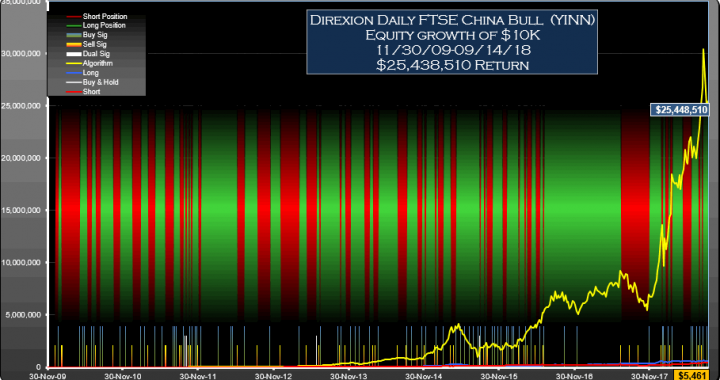 Traded long only (no short selling) the signals would have returned $23,562, an annualized return of 78.1%. 47.8% of time was spent holding stock long. The return would have been $10,782 (an annualized return of 41.7%) if you had bought and held the stock for the same period. 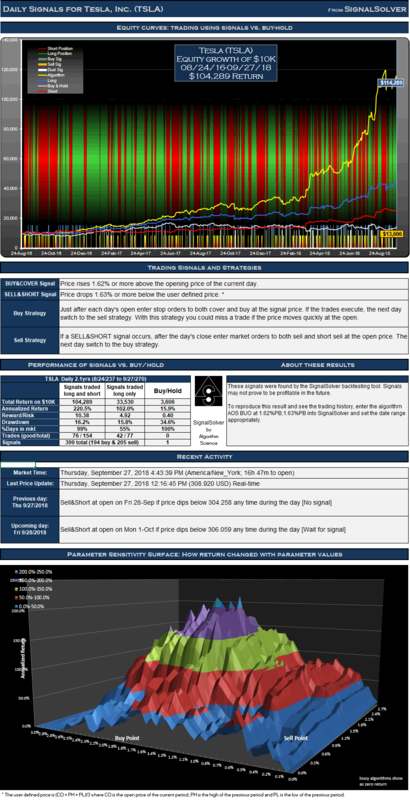 We call this a daily strategy as daily OHLC data is used in the numerical analysis leading to at most one buy signal and one sell signal per day. However, not all signals result in trades. If you are already long in a security, buy signals are not acted upon, similarly if you are short you should ignore sell signals. There were 259 buy signals and 290 sell signals for this particular AMZN strategy which in turn led to 128 round trip long trades of which 81 were profitable, and 128 short trades of which 64 were profitable. Drawdown (the worst case loss for an single entry and exit into the strategy) was 13% for long-short and 8% for long only. This compares to 29% for buy-hold. 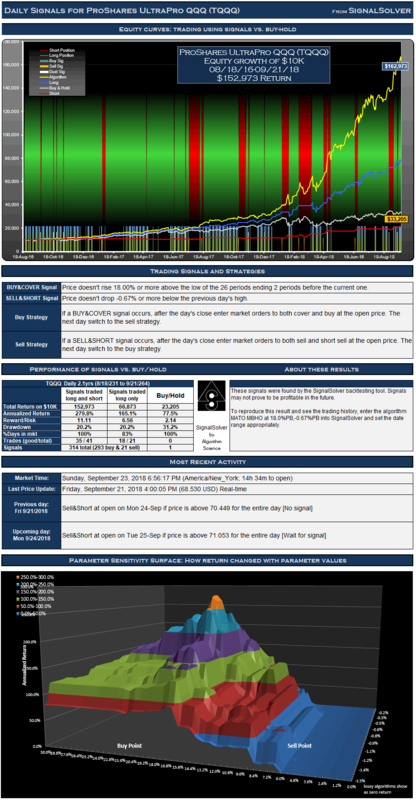 The reward/risk for the trading long and short was 6.31 compared to 1.21 for buy-hold, a factor of 5.2 improvement. If traded long only, the reward/risk was 5.91. We use drawdown plus 5% as our risk metric, and annualized return as the reward metric. The algorithm uses Bollinger bands with an SD (Excel STDEVPA) of the trailing 50 (H+L)/2 prices, scaled by a factor of 10. The backtests assume a commission per trade of $7. " The trading signals for NVIDIA (NVDA) were selected for their reward/risk, longevity and parameter sensitivity characteristics. Backtests don't always generate reliable signals which can be counted on moving forward but many traders find value in knowing what buy and sell signals would have worked well in the past. 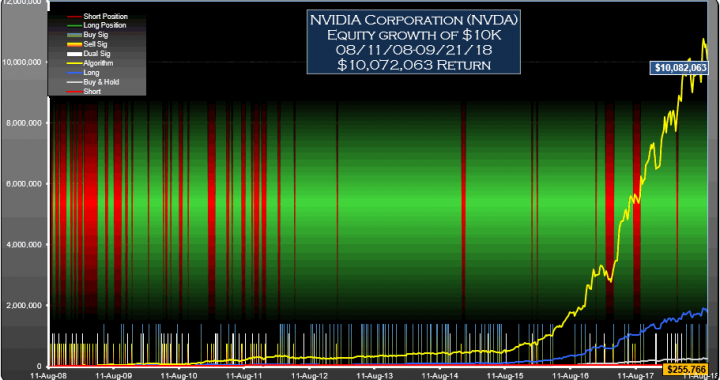 For the 528 week (10.1 year) period from Aug 11 2008 to Sep 21 2018, these signals for NVIDIA (NVDA) traded both long and short would have yielded $10,072,063 in profits from a $10,000 initial investment, an annualized return of 98.3%. 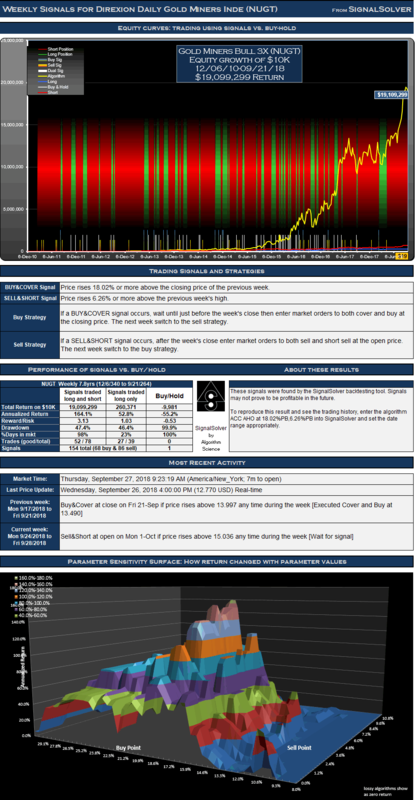 Traded long only (no short selling) the signals would have returned $1,789,777, an annualized return of 67.2%. 81.9% of time was spent holding stock long. The return would have been $245,766 (an annualized return of 37.8%) if you had bought and held the stock for the same period. We call this a weekly strategy as weekly OHLC data is used in the numerical analysis leading to at most one buy signal and one sell signal per week. However, not all signals result in trades. If you are already long in a security, buy signals are not acted upon, similarly if you are short you should ignore sell signals. There were 144 buy signals and 106 sell signals for this particular NVDA strategy which in turn led to 34 round trip long trades of which 21 were profitable, and 34 short trades of which 28 were profitable. Drawdown (the worst case loss for an single entry and exit into the strategy) was 47% for long-short and 37% for long only. This compares to 54% for buy-hold. The reward/risk for the trading long and short was 1.89 compared to 0.64 for buy-hold, a factor of 3.0 improvement. If traded long only, the reward/risk was 1.60. We use drawdown plus 5% as our risk metric, and annualized return as the reward metric. The backtests assume a commission per trade of $7. Returns have been adjusted for the worst case effects of 24 dividends. 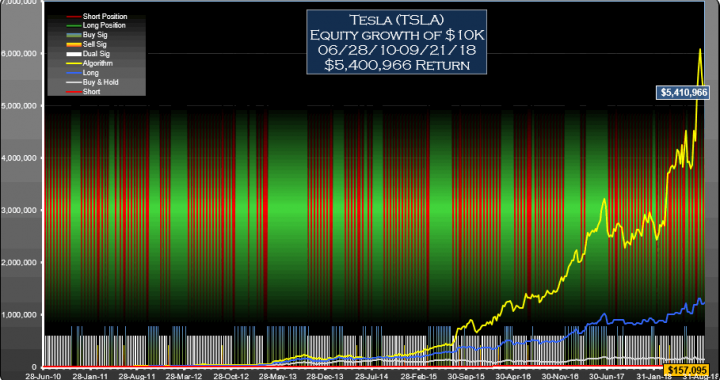 The trading signals for Tesla (TSLA) were selected for their reward/risk, longevity and parameter sensitivity characteristics. Backtests don't always generate reliable signals which can be counted on moving forward but many traders find value in knowing what buy and sell signals would have worked well in the past. 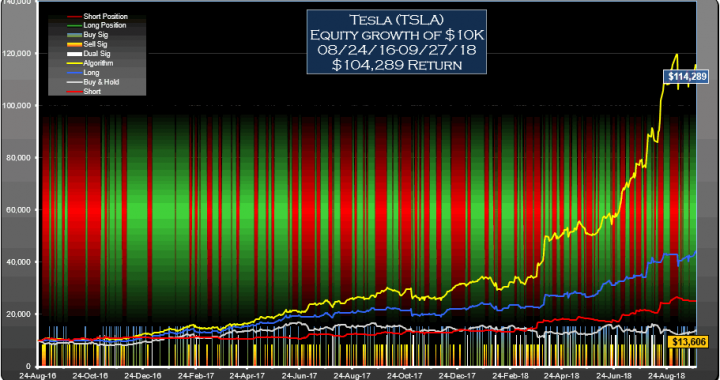 For the 430 week (8.2 year) period from Jun 28 2010 to Sep 21 2018, these signals for Tesla (TSLA) traded both long and short would have yielded $5,400,966 in profits from a $10,000 initial investment, an annualized return of 115.0%. 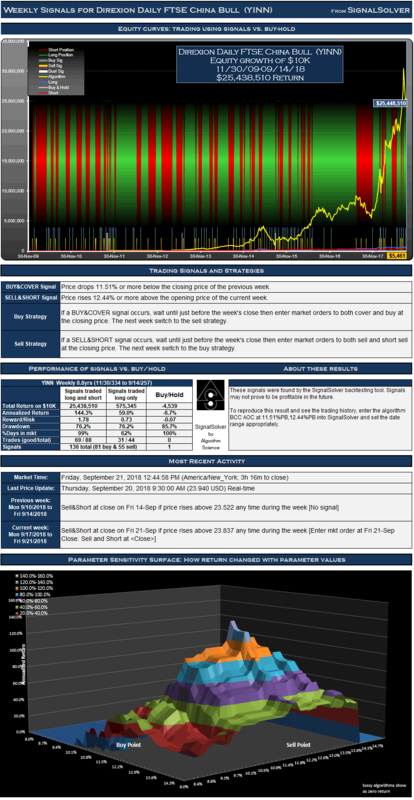 Traded long only (no short selling) the signals would have returned $1,231,823, an annualized return of 79.8%. 62.6% of time was spent holding stock long. The return would have been $147,095 (an annualized return of 39.8%) if you had bought and held the stock for the same period. Not all signals are acted upon and signals are often reinforced in this type of strategy. If you are long in the security, buy signals are not acted on, for example. Similarly if you are short you must ignore sell signals. There were 375 buy signals and 275 sell signals for this particular TSLA strategy .These led to 142 round trip long trades of which 84 were profitable, and 143 short trades of which 83 were profitable. This is a weekly strategy; weekly OHLC data is used to derive all signals and there is at most one buy and sell signal and one trade per week. Drawdown (the worst case loss for an single entry and exit into the strategy) was 37% for long-short and 32% for long only. This compares to 44% for buy-hold. The reward/risk for trading long and short was 2.71 compared to 0.82 for buy-hold, a factor of 3.3 improvement. If traded long only, the reward/risk was 2.13. We use drawdown plus 5% as our risk metric, and annualized return as the reward metric. 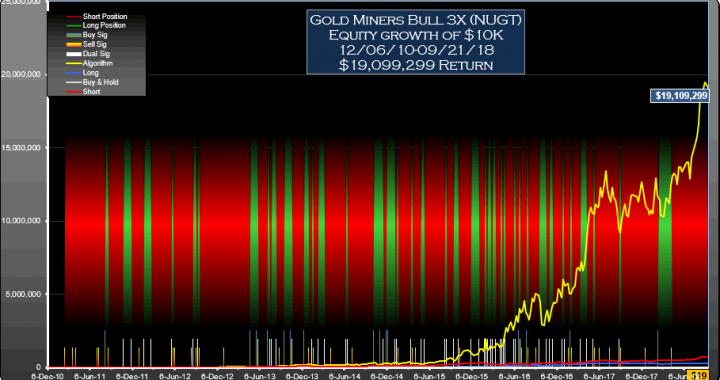 The trading signals for Gold Miners Bull 3X (NUGT) were selected for their reward/risk and parameter sensitivity characteristics. Backtests don't always generate reliable signals which can be counted on moving forward but many traders find value in knowing what buy and sell signals would have worked well in the past. 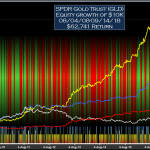 For the 407 week (7.8 year) period from Dec 6 2010 to Sep 21 2018, these signals for Gold Miners Bull 3X (NUGT) traded both long and short would have yielded $19,099,299 in profits from a $10,000 initial investment, an annualized return of 164.1%. 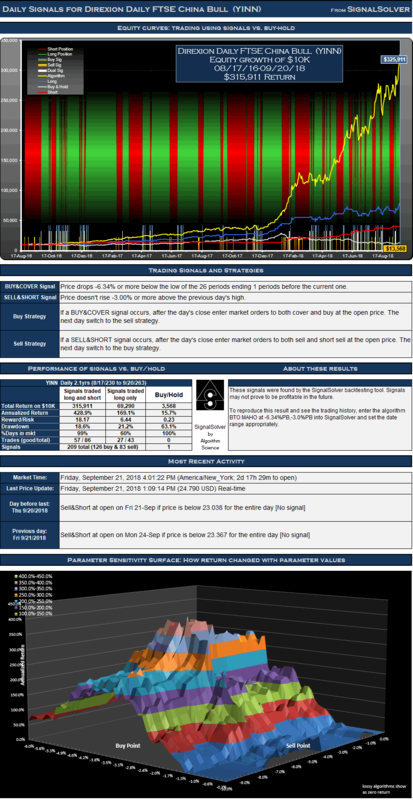 Traded long only (no short selling) the signals would have returned $260,371, an annualized return of 52.8%. 23.2% of time was spent holding stock long. The return would have been $9,981 (an annualized return of 9.3%) if you had shorted the stock for the same period. Not all signals are acted upon and signals are often reinforced in this type of strategy. If you are long in the security, buy signals are not acted on, for example. Similarly if you are short you must ignore sell signals. There were 68 buy signals and 86 sell signals for this particular NUGT strategy .These led to 39 round trip long trades of which 27 were profitable, and 39 short trades of which 25 were profitable. This is a weekly strategy; weekly OHLC data is used to derive all signals and there is at most one buy and sell signal and one trade per week. Drawdown (the worst case loss for an single entry and exit into the strategy) was 47% for long-short and 46% for long only. This compares to 28% for short-hold. The reward/risk for the trading long and short was 3.13 compared to 0.28 for short-hold, a factor of 11.1 improvement. If traded long only, the reward/risk was 1.03. We use drawdown plus 5% as our risk metric, and annualized return as the reward metric. The trading signals for Square (SQ) were selected for their reward/risk and parameter sensitivity characteristics. Backtests don't always generate reliable signals which can be counted on moving forward but many traders find value in knowing what buy and sell signals would have worked well in the past. 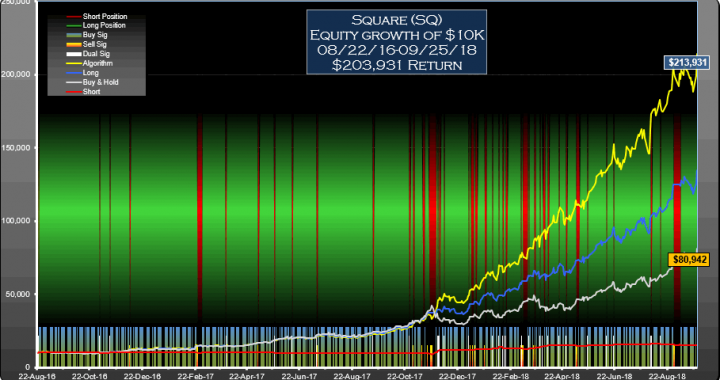 For the 528 day (2.1 year) period from Aug 22 2016 to Sep 25 2018, these signals for Square (SQ) traded both long and short would have yielded $203,931 in profits from a $10,000 initial investment, an annualized return of 332.5%. 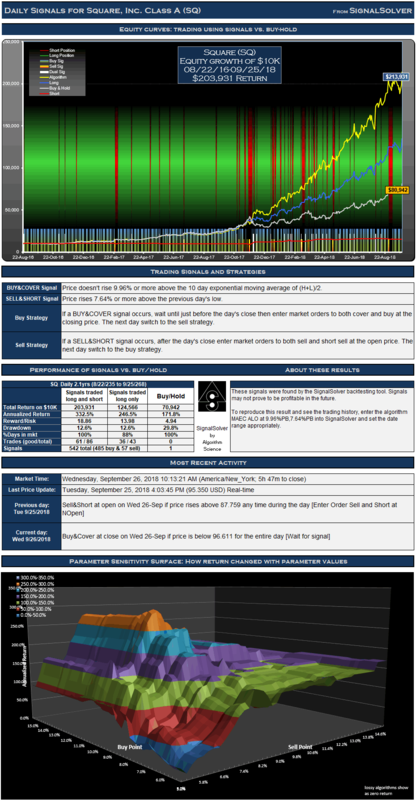 Traded long only (no short selling) the signals would have returned $124,566, an annualized return of 246.5%. 87.6% of time was spent holding stock long. The return would have been $70,942 (an annualized return of 171.8%) if you had bought and held the stock for the same period. Not all signals are acted upon and signals are often reinforced in this type of strategy. If you are long in the security, buy signals are not acted on, for example. Similarly if you are short you must ignore sell signals. There were 485 buy signals and 57 sell signals for this particular SQ strategy .These led to 43 round trip long trades of which 36 were profitable, and 43 short trades of which 25 were profitable. This is a daily strategy; daily OHLC data is used to derive all signals and there is at most one buy and sell signal and one trade per day. Drawdown (the worst case loss for an single entry and exit into the strategy) was 13% for long-short and 13% for long only. This compares to 30% for buy-hold. The reward/risk for the trading long and short was 18.86 compared to 4.94 for buy-hold, a factor of 3.8 improvement. If traded long only, the reward/risk was 13.98. We use drawdown plus 5% as our risk metric, and annualized return as the reward metric. 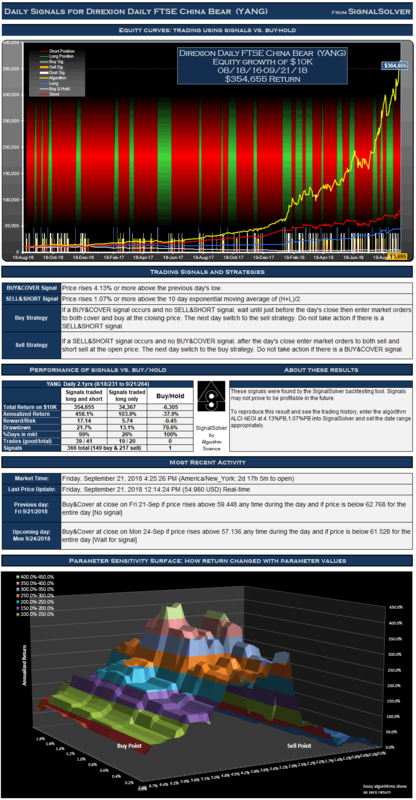 The trading signals for YANG were selected from over a million backtest results for their reward/risk and parameter sensitivity characteristics. Backtests don't always generate reliable signals which can be counted on moving forward but many traders find value in knowing what buy and sell signals would have worked well in the past. 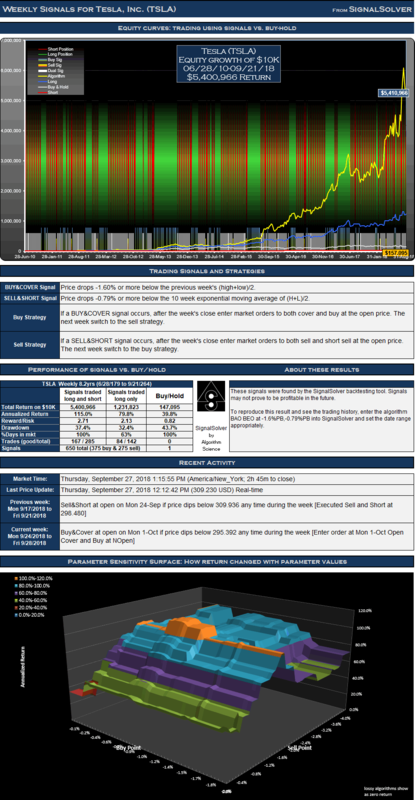 For the 528 day (2.1 year) period from Aug 18 2016 to Sep 21 2018, these signals for YANG traded both long and short would have yielded $354,655 in profits from a $10,000 initial investment, an annualized return of 458.1%. Traded long only (no short selling) the signals would have returned $34,367, an annualized return of 103.9%. 25.9% of time was spent holding stock long. 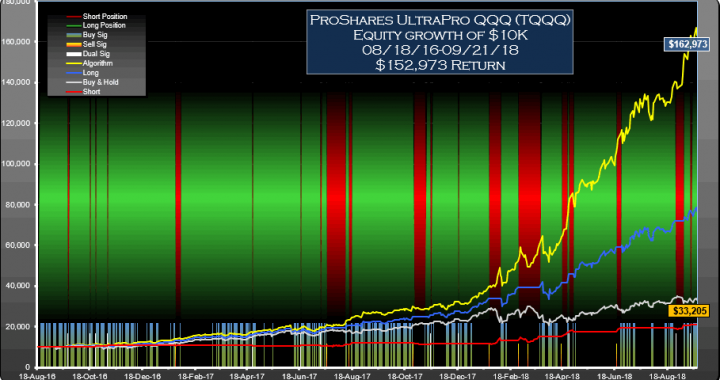 The return would have been $6,305 (an annualized return of 26.3%) if you had short sold the stock for the same period. Not all signals are acted upon and signals are often reinforced in this type of strategy. If you are long in the security, buy signals are not acted on, for example. Similarly if you are short you must ignore sell signals. There were 149 buy signals and 217 sell signals for this particular YANG strategy. In turn, these led to 20 round trip long trades of which 19 were profitable, and 21 short trades of which 20 were profitable. This is a daily strategy, meaning that daily OHLC data is used to derive all signals and there is at most one buy and sell signal and one trade per day. Drawdown (the worst case loss for an single entry and exit into the strategy) was 22% for long-short and 13% for long only. This compares to 80% drawdown for buy-hold and 28% drawdown for short-hold. The reward/risk for the trading long and short was 17.14 compared to 0.80 for short and hold, a factor of 21.5 improvement. If traded long only, the reward/risk was 5.74. We use drawdown plus 5% as our risk metric, and annualized return as the reward metric. 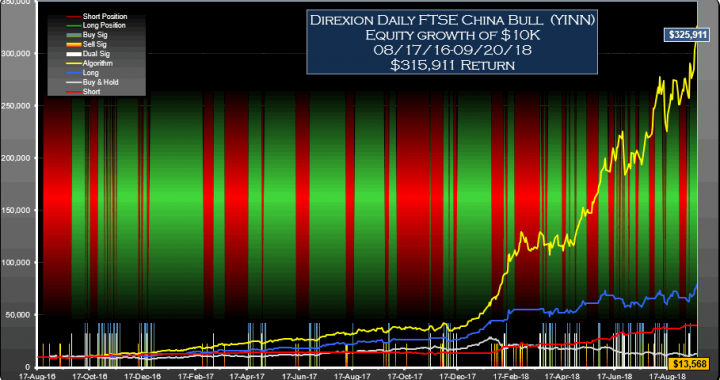 The Direxion Daily FTSE China Bull (YINN) signals (weekly) shown above were selected for their reward/risk and parameter sensitivity characteristics. Backtests don't always generate reliable signals which can be counted on moving forward but many traders find value in knowing what buy and sell signals would have worked well in the past. 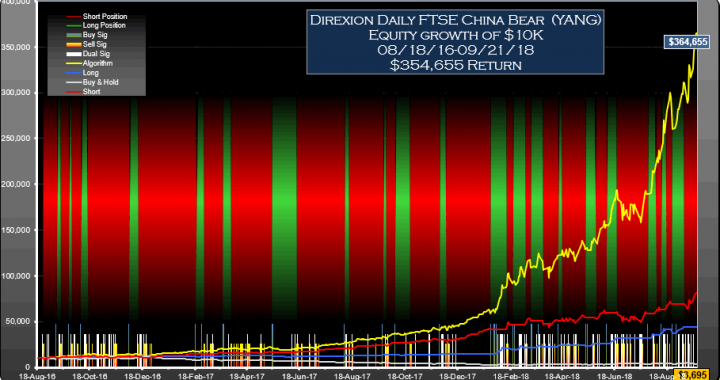 For the 459 week (8.8 year) period from Nov 30 2009 to Sep 14 2018, these signals for Direxion Daily FTSE China Bull (YINN) traded both long and short would have yielded $25,438,510 in profits from a $10,000 initial investment, an annualized return of 144.3%. 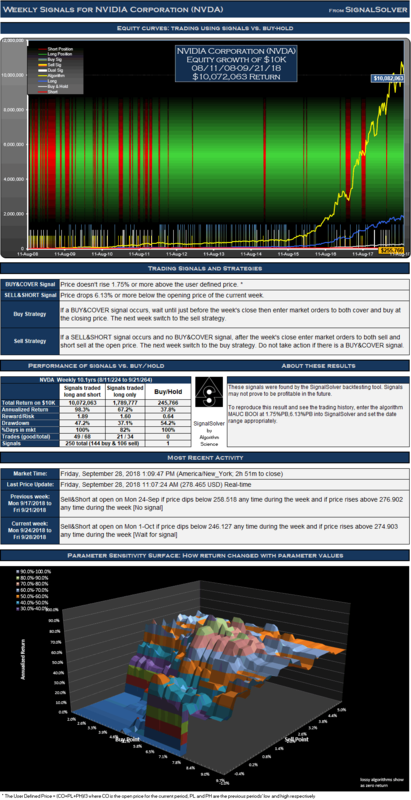 Traded long only (no short selling) the signals would have returned $575,345, an annualized return of 59.0%. 61.8% of time was spent holding stock long. The return would have been $4,539 (an annualized return of 4.4%) if you had short sold the stock for the same period. Not all signals are acted upon and signals are often reinforced in this type of strategy. If you are long in the security, buy signals are not acted on, for example. Similarly if you are short you must ignore sell signals. There were 81 buy signals and 55 sell signals for this particular YINN strategy. 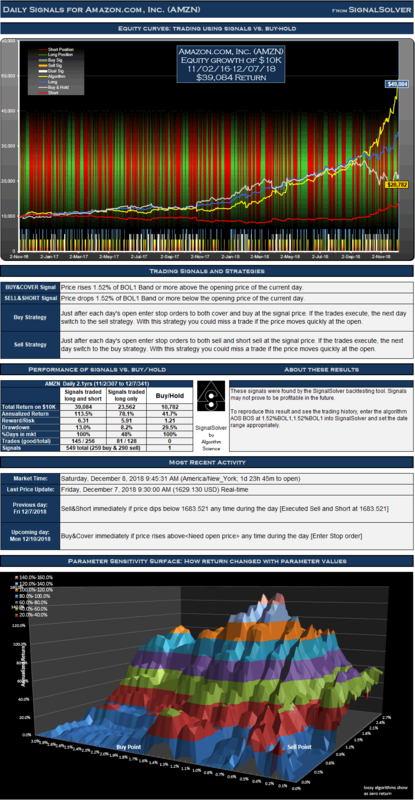 These led to 44 round trip long trades of which 31 were profitable, and 44 short trades of which 38 were profitable. This is a weekly strategy where weekly OHLC data is used to derive all signals and there is at most one buy and sell signal and one trade per week. Drawdown (the worst case loss for an single entry and exit into the strategy) was 76% for long-short and 76% for long only. This compares to 86% for buy-hold. The reward/risk for the trading long and short was 1.78 compared to 0.05 for short-hold, a factor of 35.6 improvement. If traded long only, the reward/risk was 0.73. We use drawdown plus 5% as our risk metric, and annualized return as the reward metric.